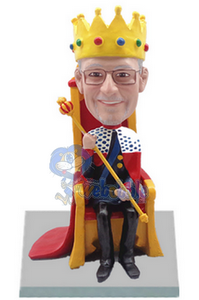 We can't all be royals, but this king custom bobblehead wears it well. Seated on his throne, shown in a crown (not included - but can be added with the option add a hat below). This custom bobblehead doll is full of character making him the king of your desk or mantle.